This item is a Paper in the Security and Privacy track. Social networking sites have been increasingly gaining popularity. Well-known sites such as Facebook have been reporting growth rates as high as 3% per week . Many social networking sites have millions of registered users who use these sites to share photographs, contact long-lost friends, establish new business contacts and to keep in touch. 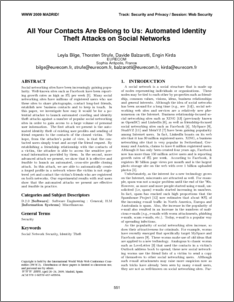 In this paper, we investigate how easy it would be for a potential attacker to launch automated crawling and identity theft attacks against a number of popular social networking sites in order to gain access to a large volume of personal user information. The ﬁrst attack we present is the automated identity theft of existing user proﬁles and sending of friend requests to the contacts of the cloned victim. The hope, from the attacker’s point of view, is that the contacted users simply trust and accept the friend request. By establishing a friendship relationship with the contacts of a victim, the attacker is able to access the sensitive personal information provided by them. In the second, more advanced attack we present, we show that it is effective and feasible to launch an automated, cross-site proﬁle cloning attack. In this attack, we are able to automatically create a forged proﬁle in a network where the victim is not registered yet and contact the victim’s friends who are registered on both networks. Our experimental results with real users show that the automated attacks we present are effective and feasible in practice.